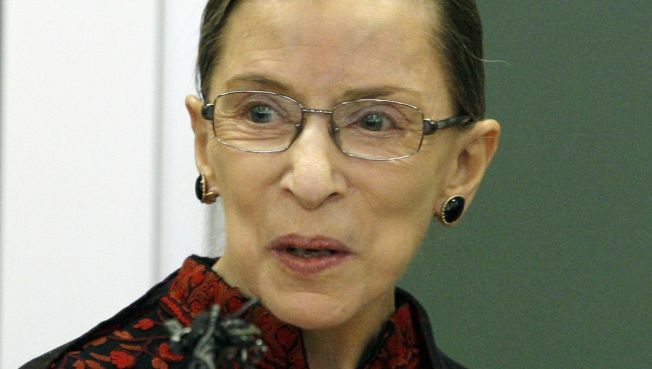 Justice Ginsburg Hints At Court Opening Soon. Will it be her, Justices Stevens or Souter? Supreme Court Justice Ruth Bader Ginsburg, 75, returned to the bench without missing a day of work after cancer surgery. BOSTON — Justice Ruth Bader Ginsburg told law students Friday there could be an opening on the Supreme Court soon but didn't hint at who might be leaving. Ginsburg, who spoke at New England Law's annual "Law Day," said the nine justices only take pictures together when a new member is added. "We haven't had any of those for some time, but surely we will soon," she said. She did not elaborate and did not take questions from reporters at the event. Court watchers suggest Ginsburg, 88-year-old John Paul Stevens and 69-year-old David Souter are the most likely to retire. Stevens has repeatedly said he still enjoys his work and has hired law clerks for the term that begins in October. Souter has said nothing about his plans and has not picked his law clerks, though he usually is one of the last justices to do so. Ginsburg, who turns 76 on Sunday, had surgery last month for pancreatic cancer but returned to the bench without missing a day of work. She was treated for colon cancer in 1999 but has said she wants to match the tenure of Justice Louis Brandeis, who served for more than two decades until age 82. Ginsburg was appointed in 1993 by President Bill Clinton. If any of the three — all on the court's liberal side — should leave, President Barack Obama would pick a successor, who most likely would not change the court's 5-4 conservative lean. Ginsburg, the court's only female justice, said advice from fellow cancer survivor and retired Justice Sandra Day O'Connor on when to schedule chemotherapy has helped her keep up with the court's pace. "She said when you're up to chemotherapy, you do it on Friday, Friday afternoon. You'll get over it over the weekend and you'll be able to come to the court on Monday," said Ginsburg, who added O'Connor returned to work nine days after being treated for breast cancer. "So I've been following her advice meticulously."